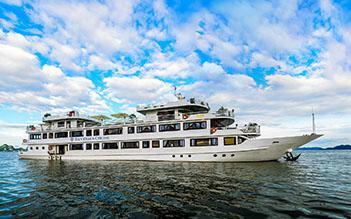 A special tour visits both Halong bay and Bai Tu Long bay with the newest 5-star cruise - Athena Elegance cruise. Within 2 days, you will have opportunity to admire majestic beauty of the bay and join many exciting activities such as kayaking, rowing bamboo boat, cooking class, night squid ﬁshing, watch a documentary ﬁlm or simply relax on roof top deck. This trip surely brings you many joyful experiences. 07.30-08.00 Optional shuttle bus will pick you up at your hotels in Hanoi Old Quarter and transfer to Halong bay. 12:45 The Cruise Manager will give a welcome speech with all the cruise information and Safety instructions. 13: 15 Enjoy the lunch with the best products of the Bay. 15.30-16.30 If you want to relax on the boat instead of participating in other activities feel free to use our sauna at no extra cost. 17:30 The Cooking Demonstration is waiting for you to discover the secrets of Vietnamese Cuisine. 21:00 Join the Squid Fishing activity. Free time on the boat. The bar is open late to serve you. Overnight at Cong Do Area. 06:30: The best time to observe Halong Bay is in the early morning and we suggest that if you didn’t get to witness it yesterday that now is your last chance. Tai Chi will be conducted again today on our upper deck and is a terriﬁc way to feel as one with the peaceful surroundings. 07:00-07.30: Light breakfast will be served this morning. 07:30-08:30: Enjoy the last stage of your trip in Thien Canh Son cave and islets, which is a wild and mysterious beauty in the middle of the World Heritage. 09:00 - 09:30: Check out of your cabin and enjoy the last stage of your trip with a delicious brunch as we continue to cruise back towards harbor through scenery. 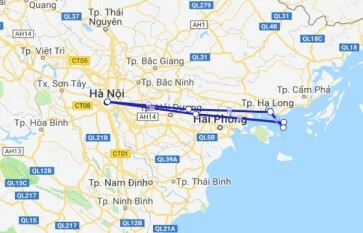 10:30: Disembark, get on shuttle mini bus and get back to Hanoi. 16:00 – 16:30: Drop off back to hotel in Hanoi Old Quarter with person having transfer. Elegent Cruise in Halong Bay Overall, it was a great trip with excellent customer service from the crew. 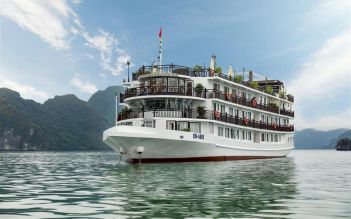 I will certainly recommend this cruise for those who wish to indulge in the serene beauty of Halong Bay. 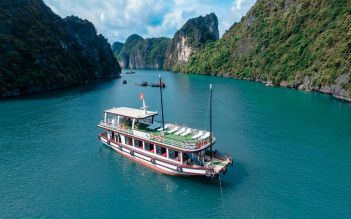 I went on the Athena Cruise as a solo traveller and enjoyed every minute on board along Halong Bay. The staff were so friendly and knowledgable. The cruise manager Tim was so polite and warm and helped me with any enquiries I had during my stay. The views were amazing of course and my room was so nice I couldn’t believe it! The activites and food on board were great especially as I was alone I still enjoyed the activities a lot and demonstrations by the staff. Will recommend to all my friends! Luxury cruises I had a cruise in 2days1night with a good service and food was delicious and the staff was helpfull special with megan she is kind so great! The athena elegency cruise is realy Excellence selecion. For me this is the first to join group and ride a cruise. It really appreciated and special thank to the group Manager He make every things easy for us and all the time he announce activities time to all. I would like really to appreciate him and his company for the better arrange. Love the food which is much better than a 5 stars hotel! The room is very clean and comfortable as well. My parents and I spent awesome time on the cruise! All the staffs are well raining and super welcoming. I want to especially thank Megan for her great hospitality and warm smile :) Nice chatting with her! We will definitely come back one day. Will recommend to friends too. If I knew Athena Cruise is such a great choice, I would spend here for more than one night.